Lighting systems for commercial environments require important consideration. From offices to retail stores, the right lighting setup can impact all areas of a business, including customer experience, long term sales growth, and employee productivity. LED World can help design the perfect setup to suit your business’s needs. We supply a large range of customisable products and offer expert advice for commercial and industrial spaces. LED track lighting is suitable for a wide range of commercial and residential applications, making it one of the most flexible and adaptable lighting products available. Track lighting systems are an ideal choice for retail shops, showrooms, art galleries, offices and industrial settings. Light concentration can easily be adjusted to suit individual needs and create dynamic spaces. Tracks are available in straight lengths of 1, 2, or 3 metres. They’re easy to customise and can be combined to create configurations such as squares, triangles, rectangles and U shapes. LED track lights clip into the tracks offering maximum versatility. There are several mounting options available, including recessed, surface mounted, and suspended via wires using suspension kits. The choice of mounting adds greatly to the overall look and feel of commercial and industrial setups, and we can offer advice on the best design for offices, showrooms, art galleries, and many other commercial applications. The simple, elegant design of linear lighting provides an excellent aesthetic and architectural appeal. They’re suitable for a variety of commercial applications such as offices, retail spaces, shopping centres, hotels and universities. These lights are highly customisable and easy to install. They’re available in standard lengths of 1.5 and 3 metres, but can be shortened to any length to suit every customer’s needs. They easily blend into their surroundings and can be finished any colour to suit a business’s particular branding or interior design. There are several mounting options available depending on the height and type of ceiling. Surface mounting is a common approach and involves installing the lights directly onto the ceiling. Suspended mounting is suitable for high ceilings or to bring lighting closer to the floor. Recessed lighting which is flush to the ceiling tends to be less common but can be suitable for spaces such as retail stores. Commercial interiors and spaces require a particular type of light to create the right style of illumination. There are two types of track lighting available; fixed (also referred to as spotlights), and flexible. Spotlight track has a similar shape to a downlight, and although the lights are fixed to one position on the ceiling, they can be rotated to point in different directions. 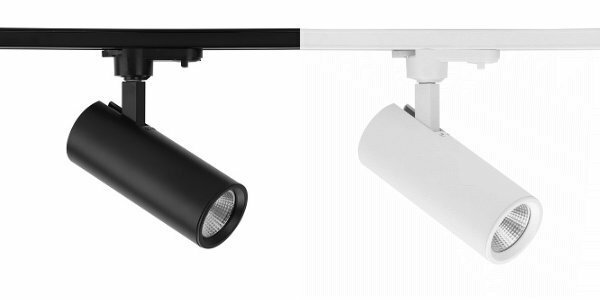 With the flexible version of LED spotlights, the light fitting can be moved along the track to different locations, allowing for maximum flexibility. It’s also possible to work with different beam angles for a spot or floor lights effect so that you can create accent or ambience illumination with ease. Although downlights are commonly used to illuminate residential spaces, they’re also widely used in commercial applications, including in areas such as hallways and walkways, bathrooms, kitchens and staff rooms. 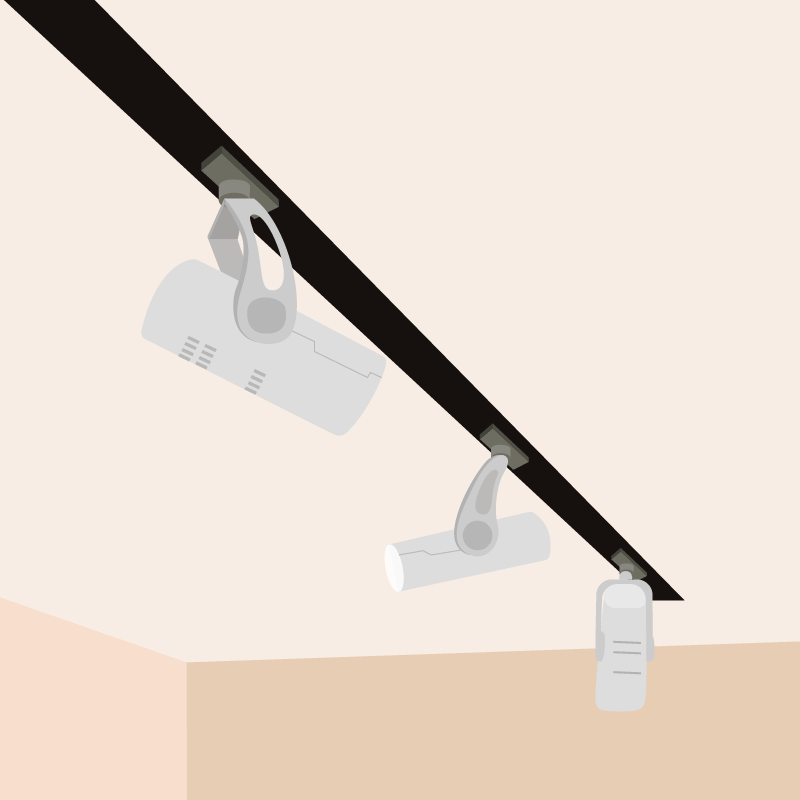 Downlights in a commercial environment are often used in conjunction with other light types, such as tack lights or linear pendant lighting. In this type of mixed configuration, it’s common for downlights to be used as ambient lighting. There are two primary mounting methods used for the installation of commercial downlights; recessed mounting or surface mounting. The lighting scheme in an office is as important as picking quality furniture and deciding on the layout. An adequate amount of artificial lighting which is strategically placed not only makes it easier to see, but can also improve staff productivity and quality of life. Getting the balance just right often requires strategic planning. It is necessary to consider how bright the office should be and the type of fixtures needed to achieve this. Dimmer fixtures will require a higher number of lights overall, whereas bright fixtures fill a bigger area. Task lighting, which refers to fixtures that provide concentrated light in a specific area is also an important consideration. These are usually strategically placed to illuminate desks and help employees see what they’re doing clearly. We provide expert design advice as well as all the products your office needs to achieve an ideal lighting scheme. Our wide range of products are highly customisable and suitable for all shops and retail stores. Many business owners overlook the importance of lighting in retail environments, when in fact, it has a strong impact on customer experience and overall sales, and plays a crucial role in the purchasing decision. The right lighting system creates a definitive ambience. It can entice shoppers to consider items they wouldn’t usually look at, enhance featured products, and communicate the quality of your products or services. An optimum lighting setup can also increase employee productivity and friendliness. We are experts in commercial lighting projects and can offer advice on how to use lighting systems to create an optimal shopping experience. For instance, guiding customers and enticing them to spend more time in your store, creating long lasting impressions, and increasing the likelihood of customers returning in the future. Commercial kitchen lighting plays as critical a role in its environment as any other practical fixture chosen to outfit these specialized workspaces. Lighting plays an important role in not only helping facilitate the performance of those working in the kitchen but must also be chosen in compliance with the specific requirements related to food safety and contamination abatement. Traditionally, fluorescent lighting has been used in these environments because of its low-cost and long-life. However, the drawbacks with this type of lighting include issues with burnout, high operating temperature, low lumen output, and high maintenance costs. LED lighting, on the other hand, offers a similar advantage of low-cost in addition to long-life. The added benefits unique to LED lighting include high lumen output, low operating temperature, and little-to-no maintenance costs. Check out our range of commercial kitchen lighting here. Commercial ceiling lights come in a variety of different shapes and sizes, and are mainly differentiated from domestic fittings by their light output. When choosing the correct lighting for a commercial space, you’ll need to consider what needs to be illuminated as well as the type of ceiling. For instance, a T-bar dropped ceiling, standard plasterboard, vaulted, or exposed / industrial style. Commercial ceilings also come in many different materials and heights, such as plaster, gyprock, tiles, or open ceilings. Commercial lighting can be suspended, but the set up will depend on the ceiling type and mounting height required to illuminate the displays. To most people, only ceiling lights come to mind when they think about lighting. But there are other important areas in a building which also need to be illuminated - for various reasons - including the walls and the floor. Wall lights are commonly used in retail environments, where the look of a light fitting is an important factor when it comes to creating the space. They not only act as a source of illumination, but also add an impactful aesthetic layer. 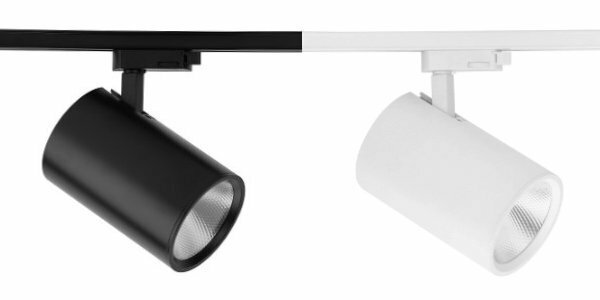 Our Track Light Series, available in 15W, 30W and 40W and Linear Lighting Series can both be mounted on a wall. Generally speaking, 10% of a building’s overall lighting footprint will account for outdoor lighting. On commercial projects, however, this percentage tends to increase for a number of reasons, including an increased need for security and late night operating hours. It is essential that all outdoor lighting products have an IP65 waterproof rating. At LED World, all our outdoor lights have been tested and approved to this rating standard. Indoor and interior lighting plays an important role in the overall look and feel of an indoor space and typically makes up 80 - 90% of a building’s total lighting footprint. As well as influencing the overall aesthetic and mood with illumination, the light fitting itself also creates a physical aesthetic. For instance, depending on the look required, fittings can be installed in a discreet manner using recessed mounting, or they can be “featured” by using suspension mounting. We typically recommend using either our Track Lighting Series or our Linear Profile Series for the best results. For commercial interior spaces, the Building Code of Australia (BCA) dictates a maximum lighting wattage-per-square-metre. To help meet these requirements, it’s necessary to submit a lighting plan along with your building permit application. Should you need any assistance with this, we’re happy to help. Recessed lighting is an excellent option when trying to create a seamless, elegant lighting design in a retail environment. This is a popular choice for large retail stores like H&M, who use this design across stores worldwide. 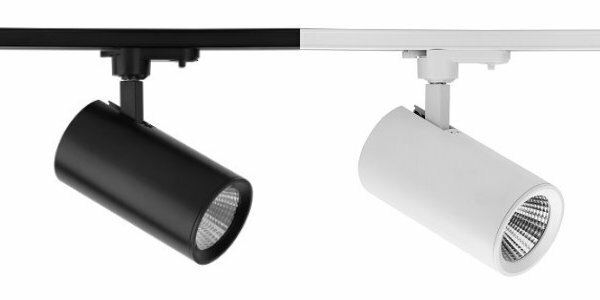 Recessed commercial linear profile lights are also chosen to illuminate office spaces, as they can be joined together to create a seamless, simple yet effective lighting solution. It can be hard to decide on the best type of lighting to install within a commercial space. However, bulkheads are often an ideal solution to create recessed lighting within the ceiling and are often overlooked. Pendant lighting, which means hanging or suspended lighting from the ceiling, is a common choice for commercial environments. It works well in spaces with high ceilings, as it allows the source of light to be as close to the area which needs to be illuminated as possible. Suspension mounted lights are best suited for areas with open ceiling plans and spaces, and we usually recommend using LED World’s Track Lighting Series or Linear Lighting Series. Both of these products can be suspended using our kits, which come in lengths of 1.5 and 3 metres. Both of these options can be shortened to suit individual needs. All our commercial lighting products are kept in stock and our lead time on the Australian East Coast is just 48 hours. We use premium grade packaging to ensure our products arrive in perfect working order, and we use industry leading courier services including Clipper, Direct Freight and others. We offer expert advice on commercial lighting design. Whether you’re building from scratch or renovating your current setup, our design team can make tailored recommendations to create the perfect lighting project for retail spaces, showrooms, art galleries and offices. Once we’ve received your reflective ceiling plan and discussed your vision, we’ll assess your space and suggest the best type of lighting to suit your needs.